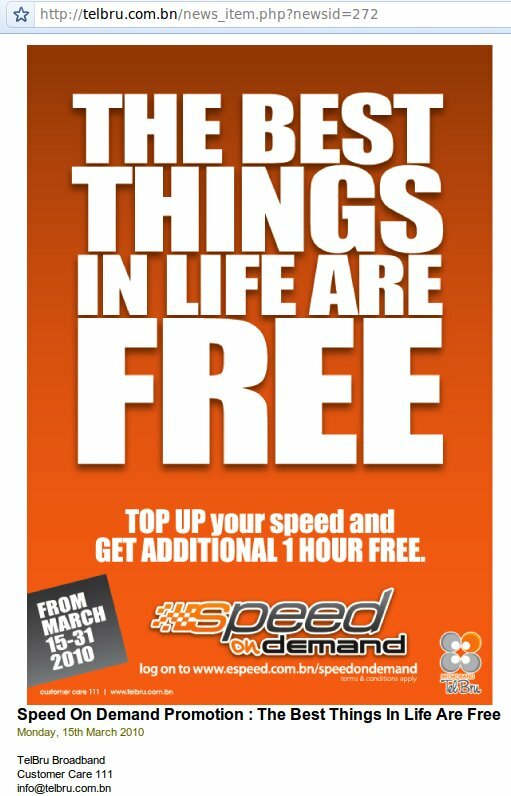 eSpeed’s Speed on Demand service is similar to the pay-per-view service on cable TV, Speed on Demand provides a pay per usage service for eSpeed users to increase their upload and download speeds for a period of time. 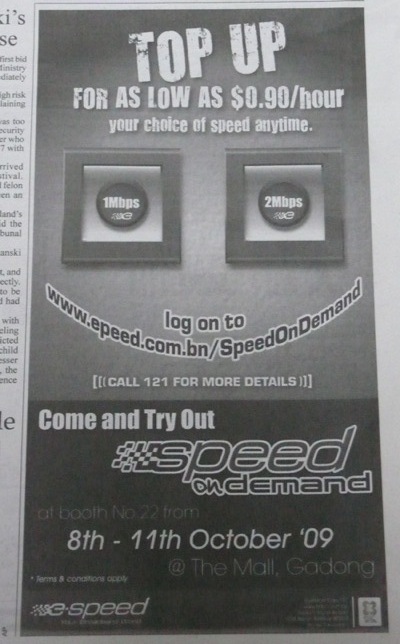 The current offering allows users to boost their downstream bandwidth to 1Mbps or 2Mbps for a period of 1 hour. The typical eSpeed user would have eSpeed value surf plan which has 512kbps / 0.512Mbps download and 128 kbps upload speeds. This service is great for the times when you need just a quick boost for instance to play online games, download things within a deadline, conference (video) calls and live streaming. I know this would have been great for my friends wedding streaming that I did 2 months ago. 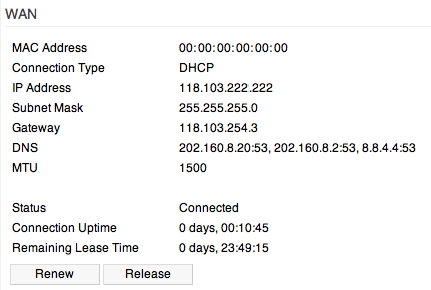 A few things to note is that you can only activate the service in blocks of 1 hour. You will have to reactivate it every hour in order to extend the service. There will be no disconnection of any service when the time period expires, it will just but cut to the normal service. The username and password is far from secure. 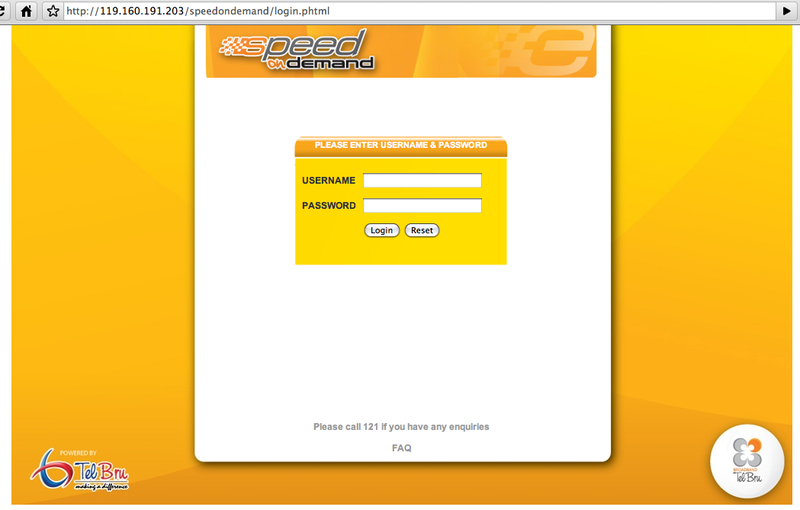 The username is the telephone number registered for the eSpeed service and the password is the account number that you get on your eSpeed bill. I would like to see something more secure than this as I believe this could be used maliciously to charge another persons eSpeed account. The account number is far from being a secure password as for payment of Telbru bills via online/telephone/ATM banking, the bill account number is used. Note this service is currently offered to users that are using Alcatel Lucent modems, not the Huawei modems as of yet as mentioned in Starboykb’s post. If you do not use the Alcatel Lucent modem you will see a message saying “speed coming to you soon” and to call 121 for further details (as shown below), but no other added details. This has led people, myself included, to believe that this Speed on Demand service is a big failure as in Starboykb’s post he mentions that he delayed his post for over 5 months waiting for Telbru to announce the service, and on announcement of the service it seems as if the website is down. There is no information that this is currently only available for Alcatel Lucent modem users. This in itself is bad on Telbru‘s public image as a majority of eSpeed Brunei users complain or have issues with their eSpeed service. My suggestions to Telbru would be to continually update their eSpeed Forum blog and/or provide means for people to ask questions and have an updated repository of FAQs. Even the advertisement in the papers gave the wrong URL for the website. After calling 121 they informed me that if you are currently using a Huawei modem, you will have to switch to an Alcatel Lucent modem. However, in order to do this they need to switch a port on their side and that means that you will have to unsubscribe and resubscribe to the eSpeed service. The technician did mention that they will be conducting maintenance tomorrow night (Sunday 11th October) at 11PM and trying to upgrade the Huawei network to support this Speed on Demand service. So if all goes well Huawei modem users will be able to try this service on Monday. I asked the person for upload speeds of the 1Mbps and 2Mbps packages and I believe he tested it on the spot and reported them as 500kbps and 600+kbps respectively. It seems they don’t advertise the upload speeds for this service nor their current eSpeed service. So all in all Speed on Demand seems like an interesting service with possibilities in the future for pay-per-view applications. Imagine Telbru having movies for rent that are accessible with this download speed, or something of this nature. This could lead to people trying to create content specifically for Brunei live streaming with pay-per-view licensing from Telbru. I for one will try this service out for any live streaming event that may come in the near future. The service itself opens up possibilities but I wonder if the PR itself will make more of a headline than the actual product. Update 1 (12/Oct/2009 am): From a Twitter conversation with tiongloong it seems that this service may be for subscribers on a different network to the older Huawei modem users. He says that he recently switched to an Alcatel Lucent modem 2 months ago but he can’t access the website. So perhaps Speed on Demand is only applicable for newer subscribers that are placed on a different network and since they are newer subscribers they have Alcatel Lucent modems. And to make things easier for the people at the roadshow the technical team just told them that it is for Alcatel Lucent modem users at the moment, not the Huawei modem users.